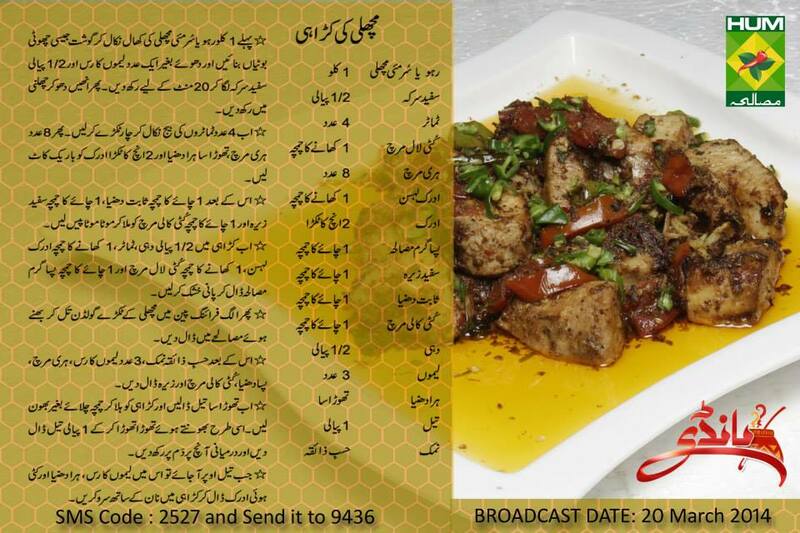 Here is the most favorite and mouth watering Machli Ki Karahi Recipe in Urdu and English by Cooking Expert Zubaida Apa at Masala TV Program Handi. • Take out the meat of the fish and add in lemon juice and ½ cup white vinegar without washing it. Then keep it in the strainer. • Deseed the tomatoes. Also chop green coriander and ginger. • Grind in 1 tsp coriander seeds, 1 tsp white cumin and 1 tsp crushed black pepper. • In the pan, add in ½ cup yogurt, tomatoes, 1 tbsp ginger garlic paste, 1 tbsp red chili flakes and 1 tsp All spice powder and cook till water dries. • In a frying pan, add in fish pieces and add it in the masala. • Add oil in the pan, add cook it. Simmer it. • When the oil separates add in lemon juice, green coriander and chopped ginger. Serve hot with nan.